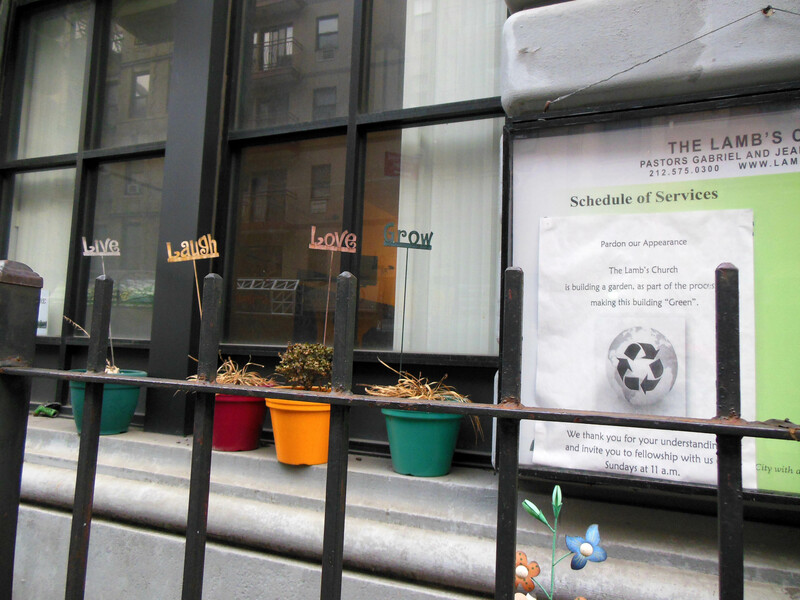 The Finger and the Moon is a work-in-progress site specific and interactive project involving several media. It’s about spirituality, respect, tolerance, doubt, human beings and differences. It’s a project of open questions. It’s about the importance of spirituality in life and the danger of fanaticism. It’s about social and anthropological issues as well. At the moment the project consists of a series of LIUBA’s site specific interactive or partecipative performances, and of a series of videos, videoinstallations, digital works, photos and objects, all coming from the performances. 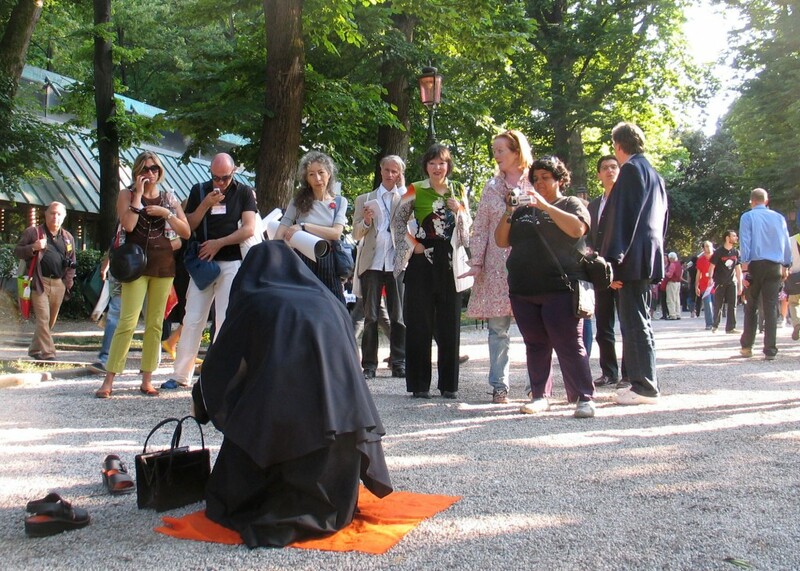 The first step of this project was an interactive performance presented at the Opening of the 52 Venice Biennale on the 7th and 8th of June 2007. 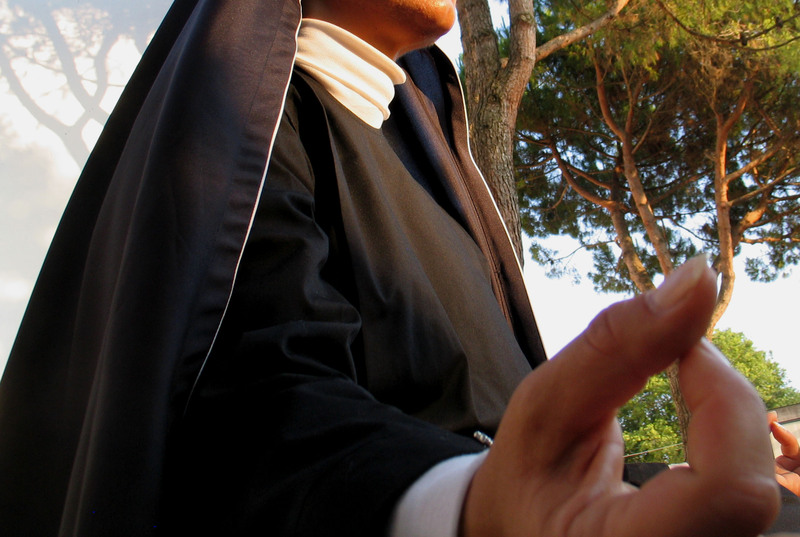 Dressed like a nun, but with a ‘multifaith’ special dress expressly conceived for this project, LIUBA prayed simultaneously with different kinds of prayers, previously deeply investigated. The project started in 2006 with a preparatory research on the main religious beliefs and on the different ways of praying in the world. 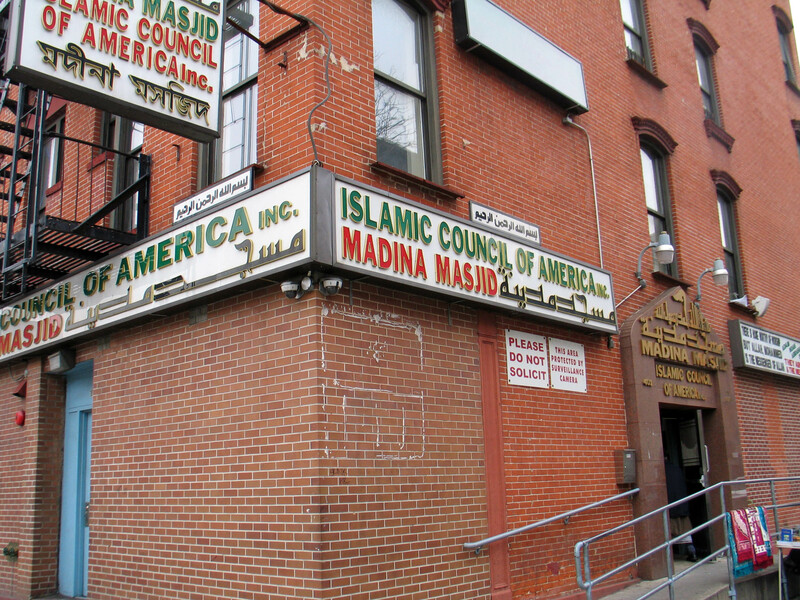 LIUBA spoke with the Imam of a Mosque and went to pray with Muslim women; She talked about Jewish Religion and Prayer with the Rabbi of a Synagogue; she investigated the practice and the spirituality of Buddhism speaking with different people; she went to pray Zazen in a Zen Temple, she traveled to a Native Reserve in Quebec, Canada, to know more about North American Native Spirituality. Then she worked with the Italian stylist Elisabetta Bianchetti to conceive of a special nun dress with multi-religious references and details. 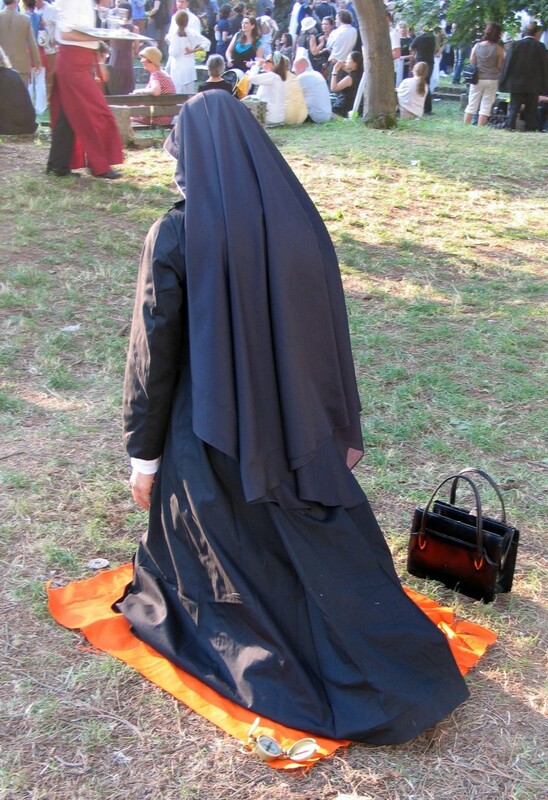 Looking carefully at the details, the dress is different from traditional religious clothing. It has been designed taking inspiration from the Renaissance Madonnas. Performing in real life situations involves unpredictability of reactions and events. LIUBA had many kinds of reactions and interactions from people, many of them meditating about the performance’s meaning or being surprised about it. 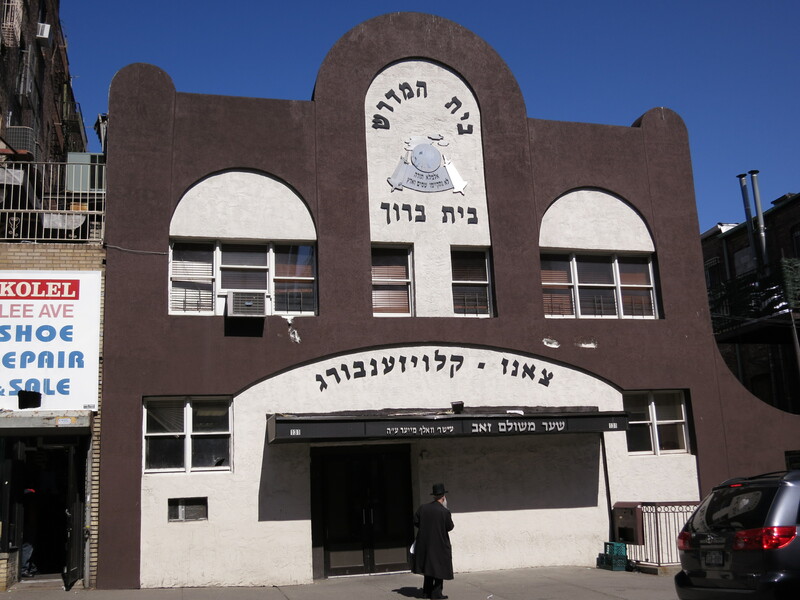 LIUBA’s cameraman, Raymonda Gentile, was hidden to the public and recorderd both the performance and people’s reactions. 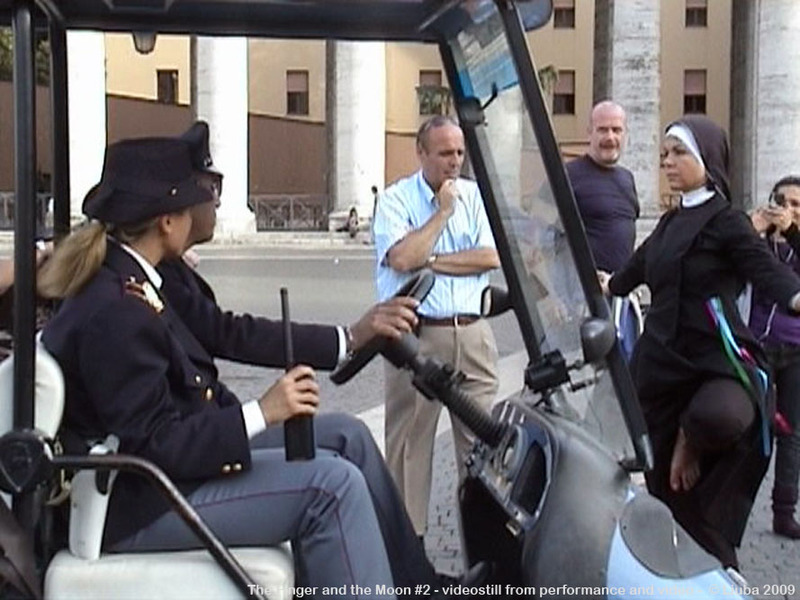 The second step of the project consisted in a urban interactive performance at St. Peter’s Square, Vatican City, on May 9, 2009. The live streaming of it was seen simultaneously in different galleries and locations around the world. 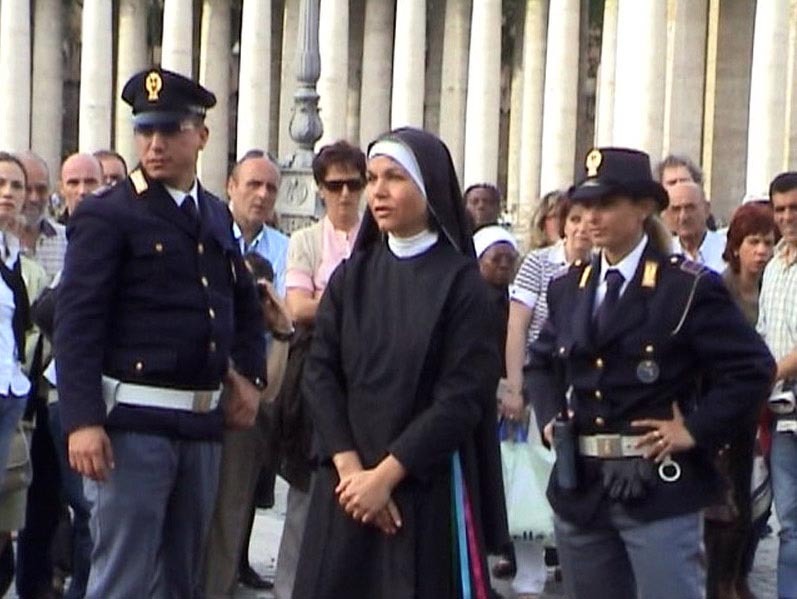 LIUBA went to S.Peter’s Square dressed as a nun. Looking carefully and up close, the nun dress was different from the one used by traditional religions, having many multi-religious references and details.. It was designed by the artist with the cooperation of stylist Elisabetta Bianchetti. 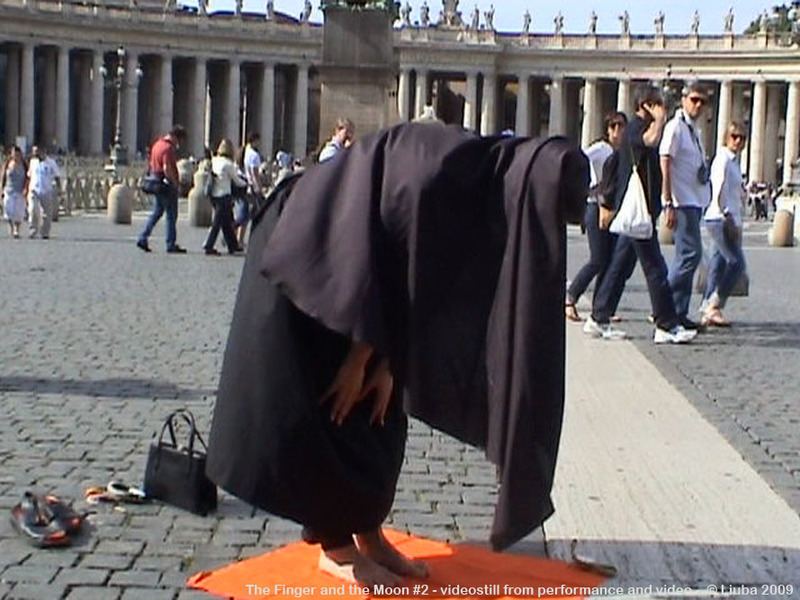 As LIUBA arrived in S.Peter Square she began to pray in many different ways following the rituals of the world’s main religions and practices. People reactions to the performance were not homogeneous: they went from disinterest to surprise to appreciation to meditation to complaint. 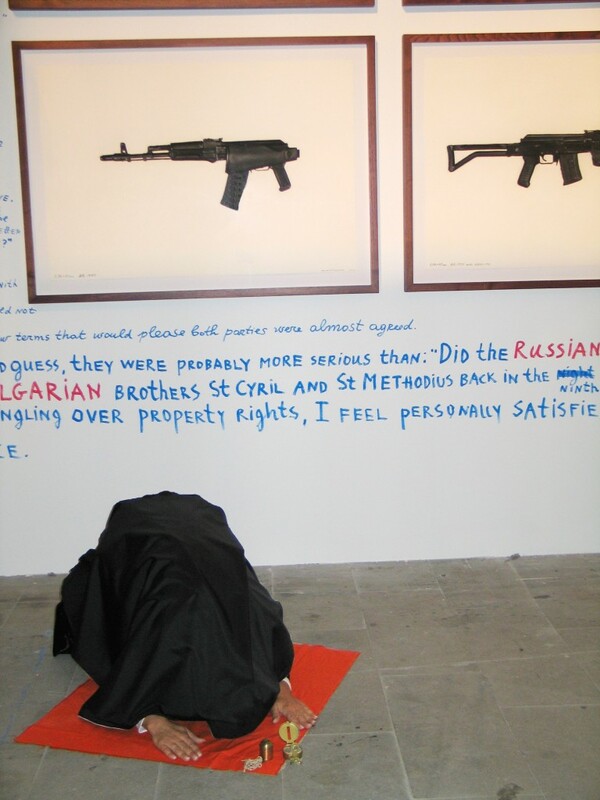 After more than one hour police stopped the artist saying it was not allowed to pray like that at the Vatican grounds. 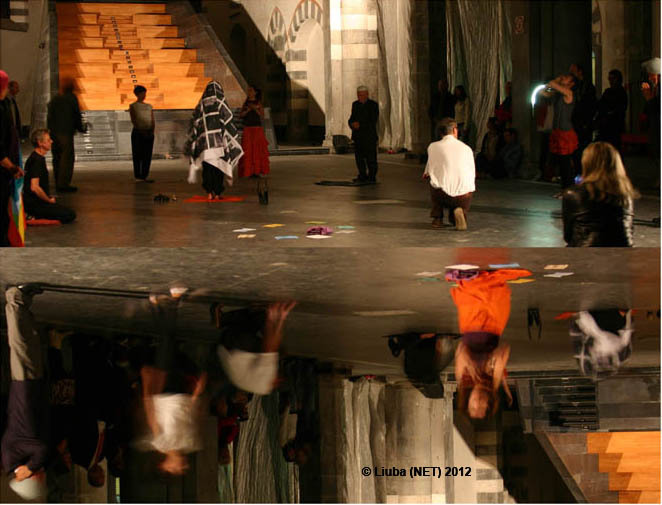 Both for the symbolic value of the location and for the unpredictability of reactions, LIUBA decided to show the performance in a live stream in different galleries and places around the world, thus simbolically connected together. 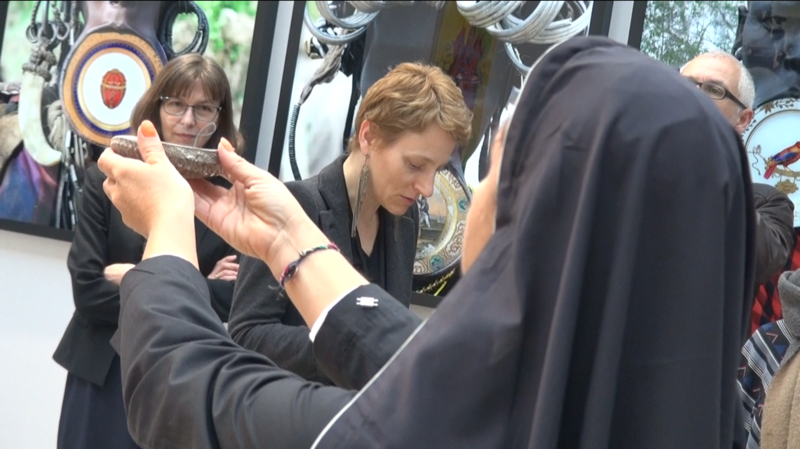 Using the possibility of advanced technologies, The Finger and the Moon #2 has been exhibited with a live streaming in galleries, artists studios, collectors houses and religion communities in different part of the world. The streaming had been seen only in ‘real and physical locations’. 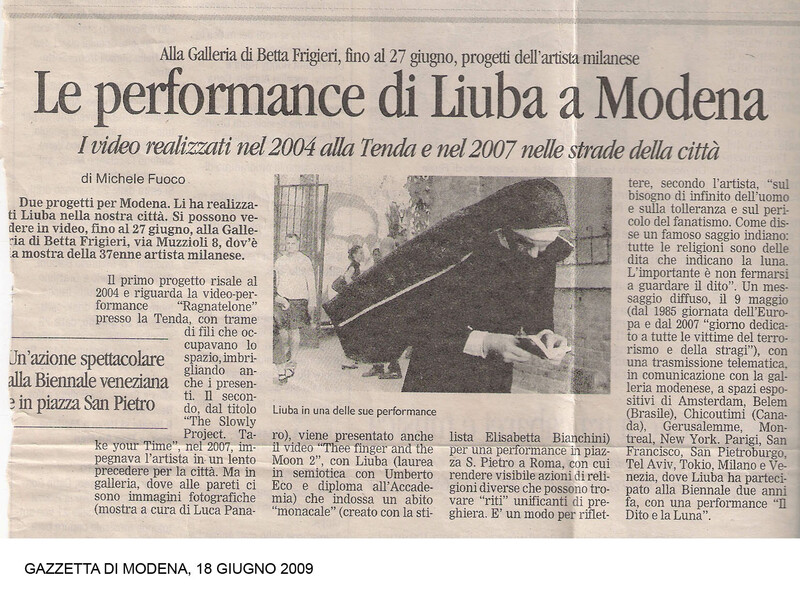 People gathered in the galleries to watch the streamed, live performance that LIUBA was performing at Vatican City. There was a password, given only to the network locations, to connect to the streaming of the event. 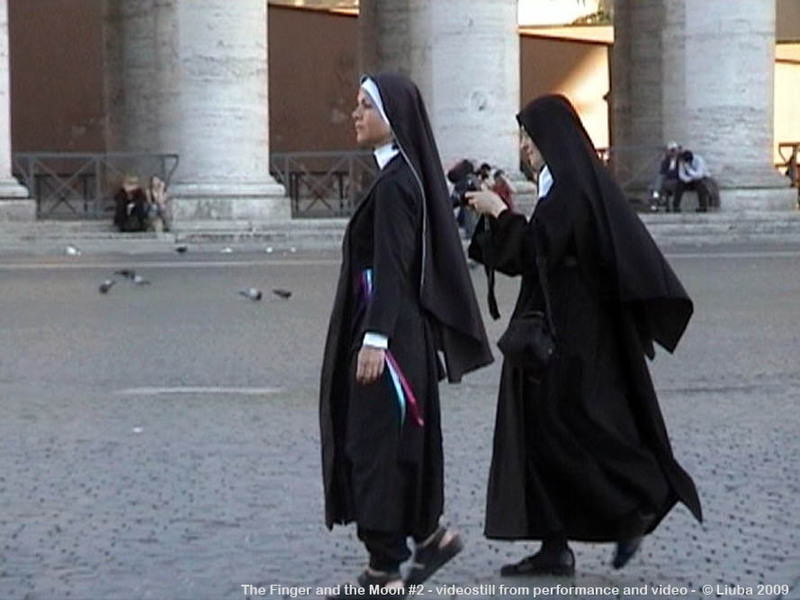 The performance was recorded by two hidden cameraman: Barbara Fantini and Raymonda Gentile. Fantini’s footage was seen live in streaming, while Gentile’s were more focused on people reactions to the performance. The places located in Amsterdam, Jerusalem, Montreal, New York, San Francisco, Saint Petersburg, Tel Aviv, Turin, Tokyo, Venice were private collector’s houses, artists studios or religious communities and therefore their address is not visible on this website. 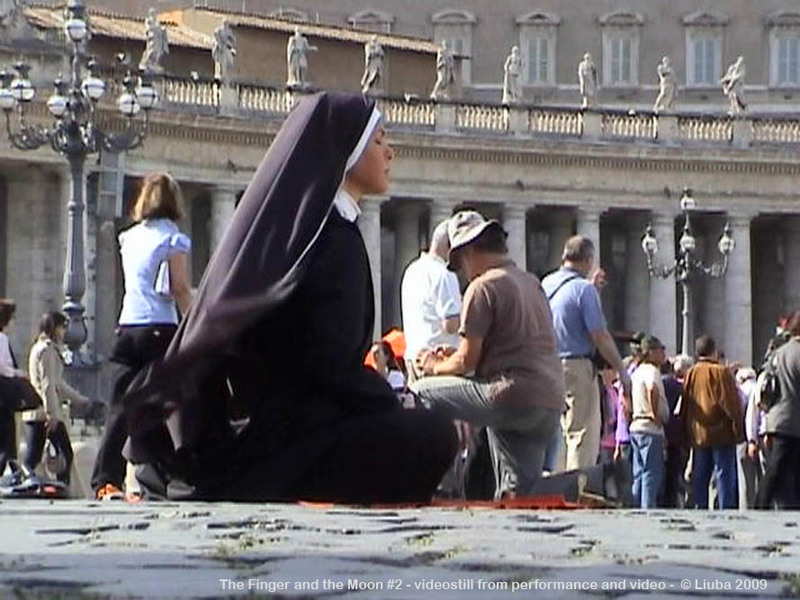 People of different faiths and beliefs took part in “Finger and the Moon #3″, meditating together with the artist, LIUBA, in a collective performance. The event, curated by Alessandra Gagliano Candela, is preceded by almost a year of site specific research and networking in the city of Genoa, by the Italian artist, supported by anthropologist Barbara Caputo. 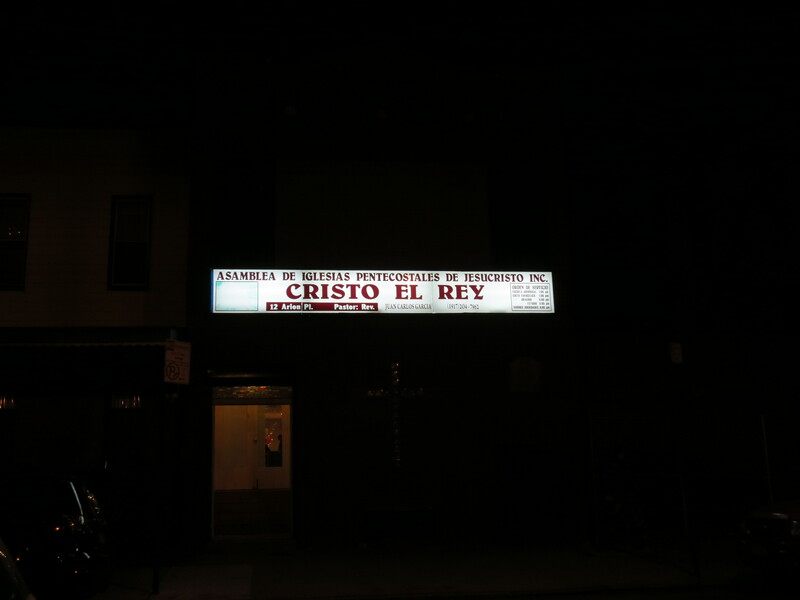 They established a direct rapport with different religious communities in the area, directly involving the inhabitants of the city into the art project. 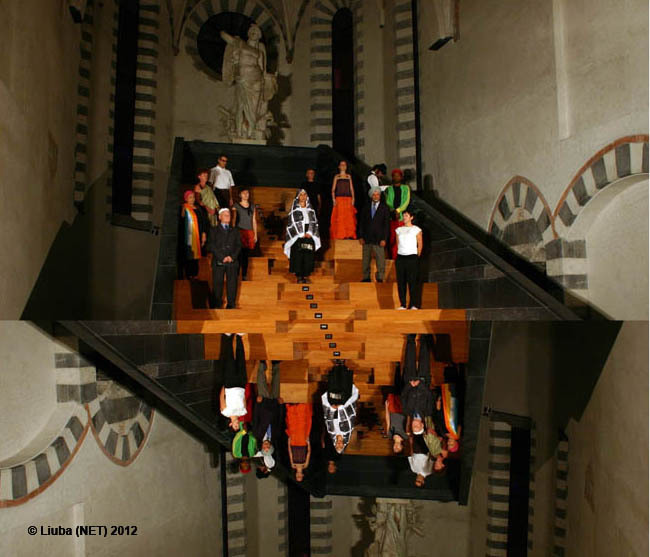 The Deconsecrated Church of Saint Agostino’s Museum, a container rich in history, lends itself particularly well to the realization of this performance/rite of great emotional and conceptual impact: LIUBA’s video-installation inside showed the videos of the two preceding stages of the project, while members of diverse religions prayed in the nave of the ancient religious building. LIUBA was wearing a new piece of artwork/clothing, the fruit of her collaboration with stylist Elisabetta Bianchetti. 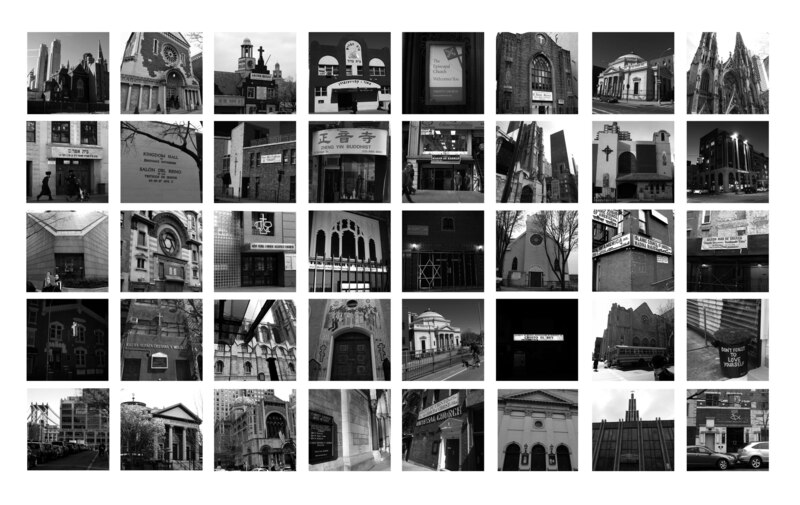 The video collects and synthesizes participants’ points of view, scenes from the performance, pictures of places of worship in NYC and some pics of the one year site-specific research and networking in the city of Genoa. 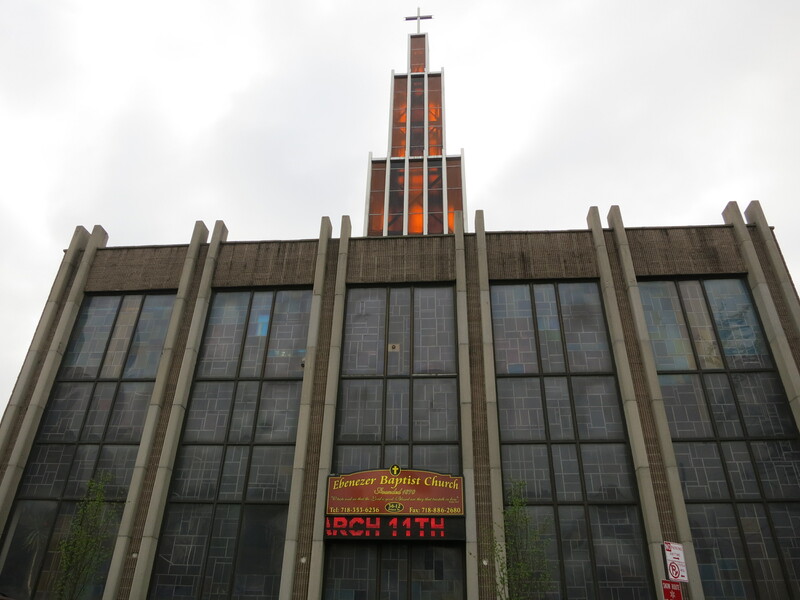 Participants met with LIUBA in the Museum’s Deconsacrated Church a few hours before the performance began. The artist explained the importance of everyone feeling well, relaxed and free during the performance; being part of a performance is not like acting in the theater, rather it is about being natural and true. All the people involved were free to meditate and act in any way he or she liked, needing only to keep in mind simple logistical/spatial rules previously decided upon. 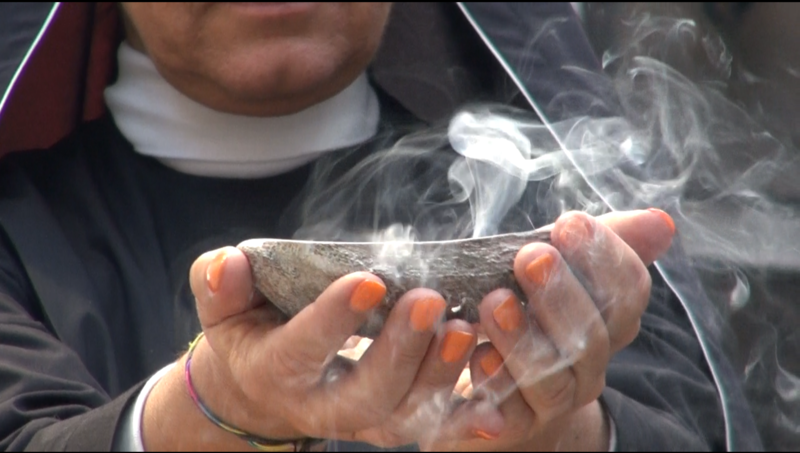 The collective performance began with all the participants on the steps of the church’s apse breathing in unison; respiration is a universal need that is common to all people, religious or otherwise. Then LIUBA descended into the nave, moving among the public and praying various prayers of many religions. 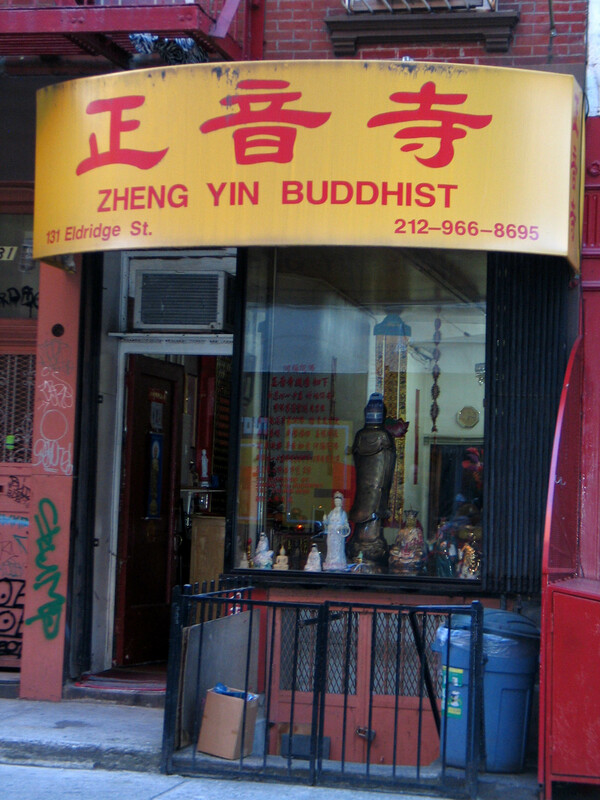 On her ad hoc oufit were images of several places of worship, temples and churches in New York City. 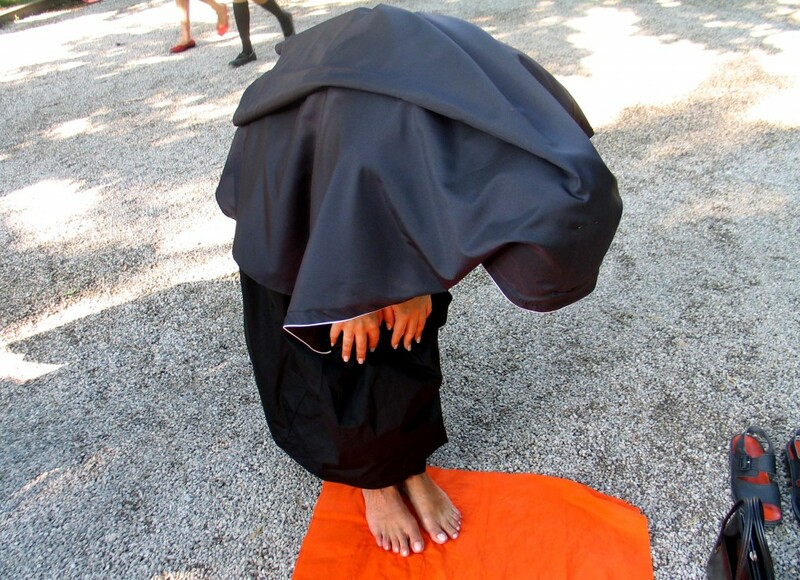 The participants then descended, one by one, into the nave while meditating individually in their own, personal ways. 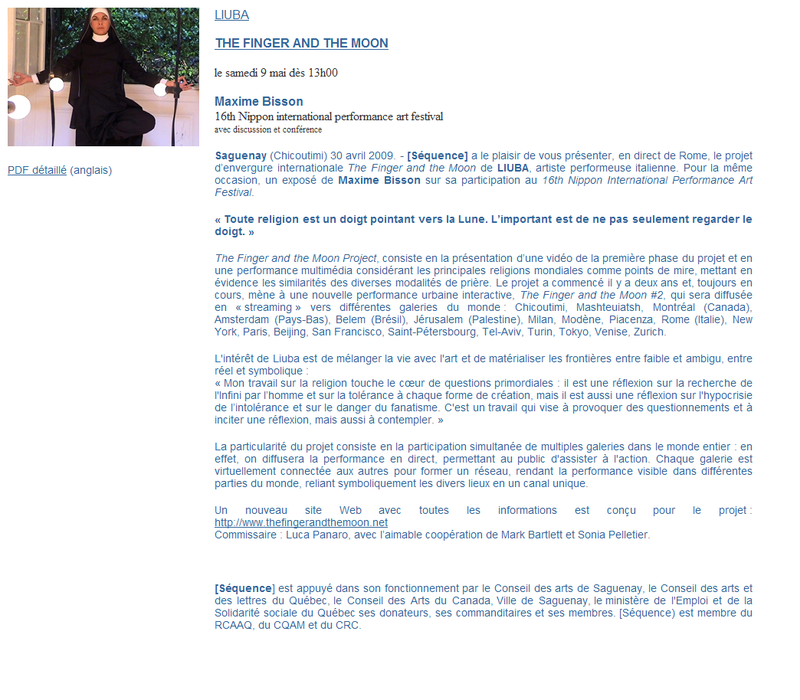 There was music composed for the event by LIUBA which mixes together some sacred music of various religions and video projections of the Finger and the Moon project videos #1 and #2. 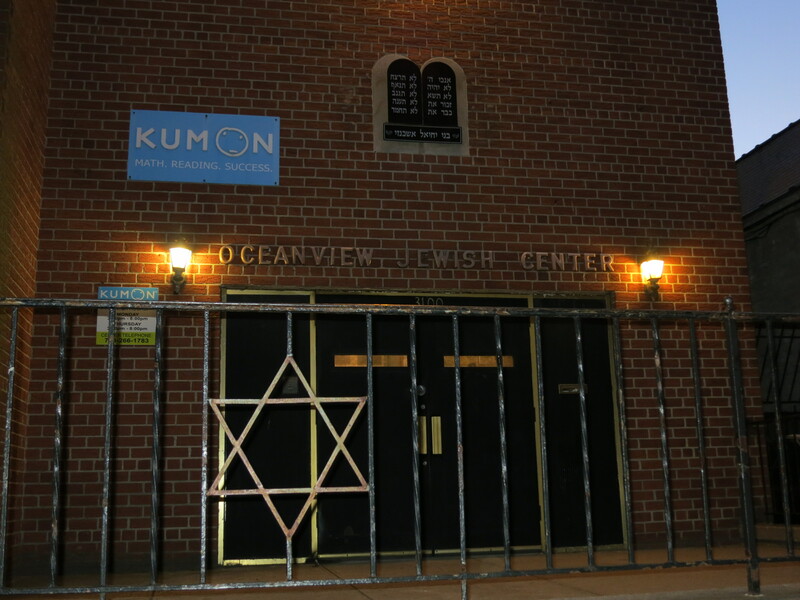 The Finger and the Moon #4 is a series of photographs taken by LIUBA in New York City, focusing on building belonging to different religions as temples, churches, mosques, sinagogues, and many others. The Finger and the Moon # 3 performance’s outfit has been made editing together The Finger and the Moon # 4 series of photographs. 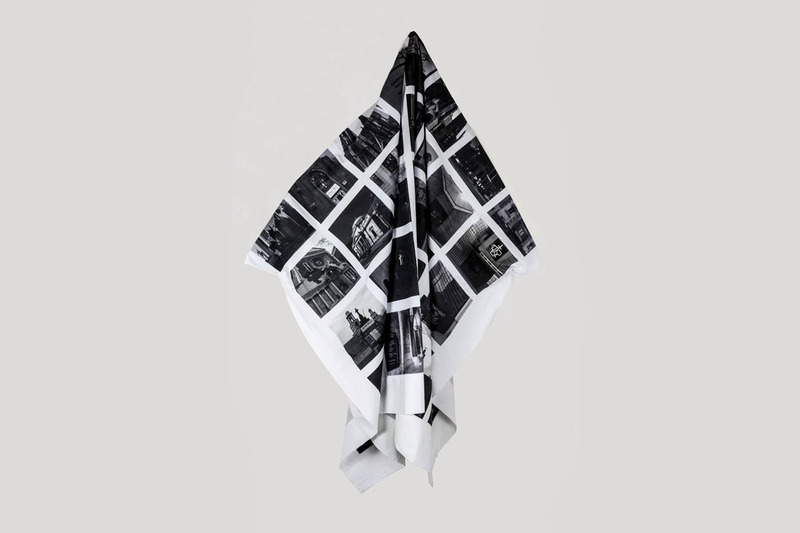 The dress-work was made ​​by the artist composing together in black and white many of those photos on fabric. The garment was produced by designer Elisabetta Bianchetti. 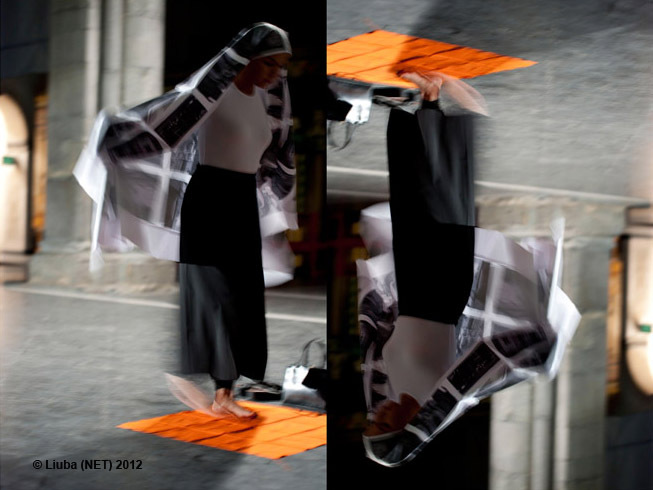 The dress-work was made ​​by the artist composing together in black and white many of those photos on fabric. The garment was produced by designer Elisabetta Bianchetti. The series is inspired by the medieval altarpieces consisting of a main image and a predella below. The works are built by assembling photographs and video stills taken from the live performances of The Finger and the Moon Project. All the images are not taken in the studio but they assemble the results of the live performances, constituing a research that opens up new conceptual, semantic and aesthetic perspectives . The Finger and the Moon #6 is part of the ongoing project which is questioning about different forms of spirituality, focusing on the concepts of tolerance, respect, fanaticism. In an era, like ours, where Spirituality and Religions are no longer just personal and private matters, but public and political as well. Invited to exhibit and perform at Art Paris 2018, I decided to develop for Paris a new version of the Finger and the Moon Project, not forgetting the deep wounds received by this city. 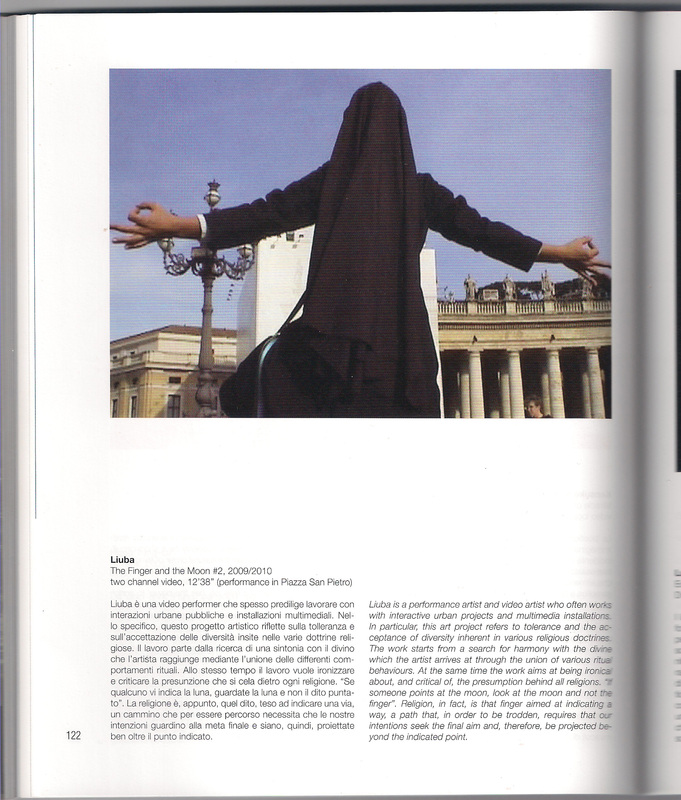 Dressed like a nun, but with a ‘multifaith’ special dress expressly conceived for this project and designed with stylist Elisabetta Bianchetti, I went through the Grand Palais praying simultaneously with rituals of the most diffused religions of the world, triggering in the audience different reactions, which have ranged from surprise, to contemplation to indifference. The video consists of a selection of footage taken during the live performance at the Grand Palais in April 2018, documenting both the performance art piece and the reaction of the public. 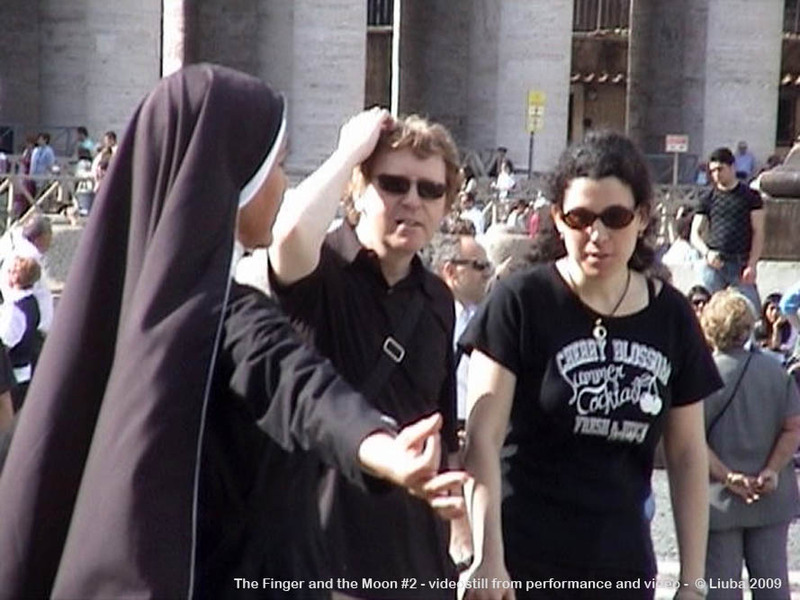 Since the The Finger and the Moon Project has already several works, and I was not interested in or could replicate what I have already strongly said with The Finger and the Moon # 2 in the Vatican, The Finger and the Moon #6 is focused on the feeling of estrangement that spirituality (multi-faith of course, with all that implies) causes in a context of ‘market’ like the one of a Contemporary Art Fair. 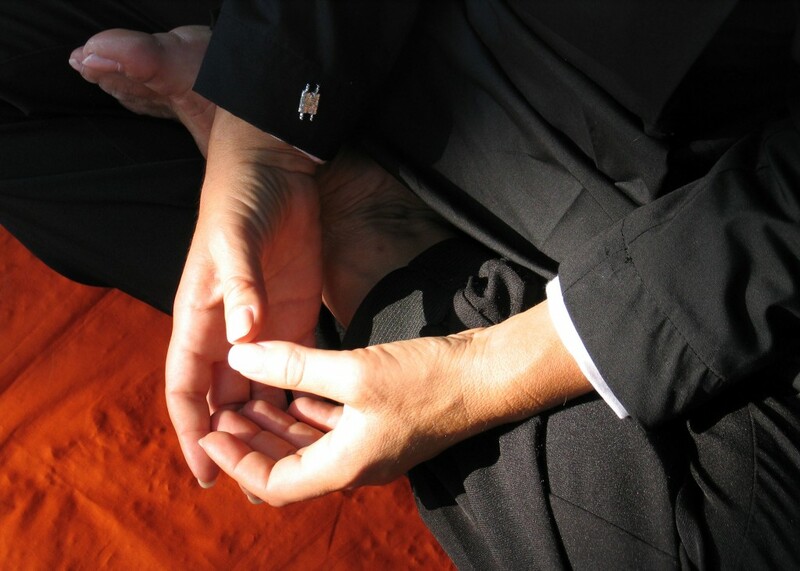 It is a work about people and their reactions, and about the contrast between spirituality and business. 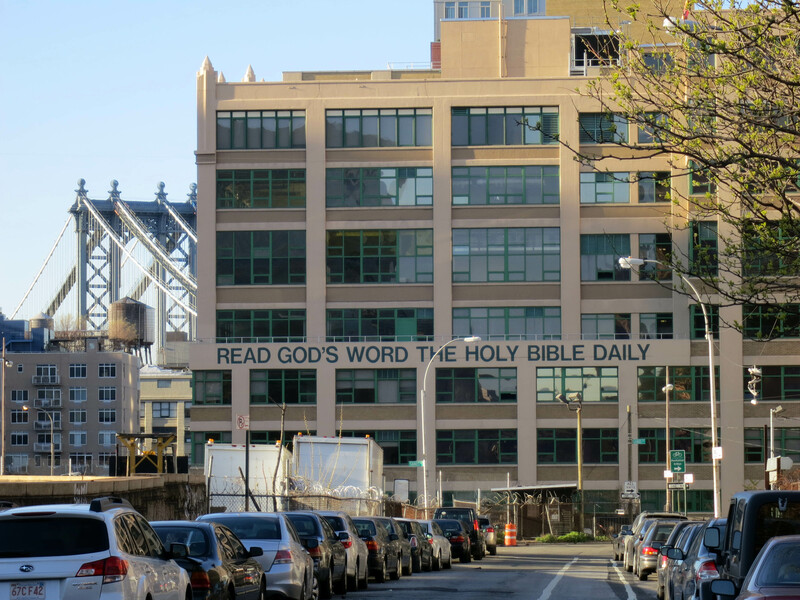 It’s interesting to notice that Spirituality seems almost an extraneous element in the Art Fair, while we know – and I am convinced of it – that art creation is always connected with spirituality, of whatever form it is. Much attention in the video was also given to music, which is the result of my research on sacred music of various peoples and religions, edited in a polyphonic manner. To this sound material coming from various parts of the world, I added pieces from Drop by Luigi Einaudi, which I thank. 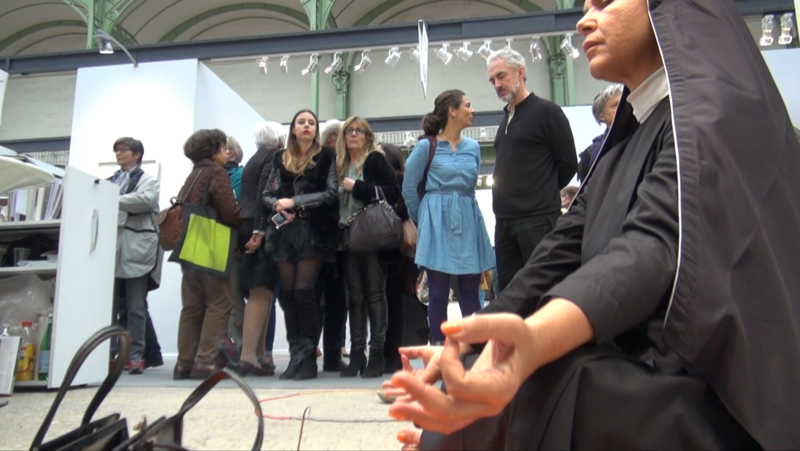 “The Finger and the moon #6, performed at Art Paris and dedicated to the memory of the victims of fanaticism, represents a critique of dogmatism and an invitation to spirituality in the world of art. According to LIUBA, in fact, meditation, prayer and spiritual life are of great importance in our daily lives and in the world of art. 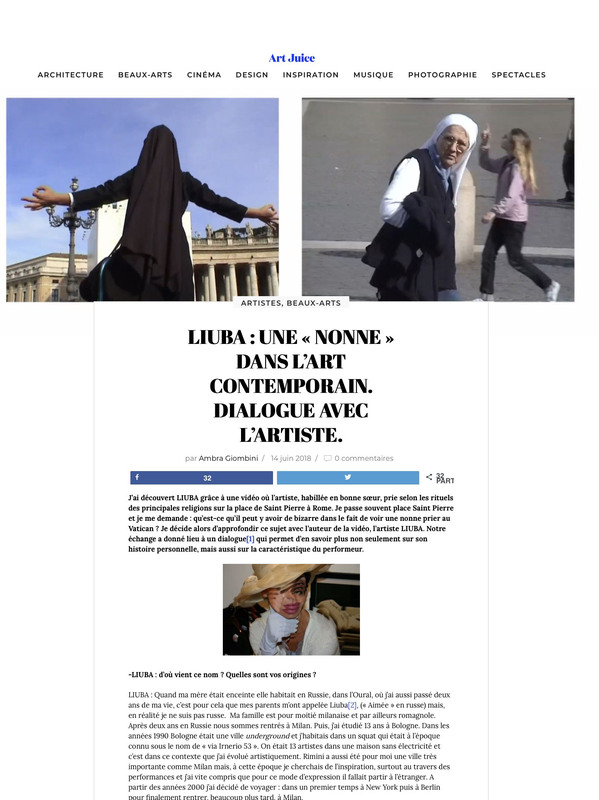 “LIUBA c’est une artiste italienne dont le type d’expression principale est la performance avec lesquelles elle réalise des vidéos. Chaque projet est mis en place pour un lieu est un sujet spécifique. Ensuite elle muséifie quelques objets issus de ses performances et qui laissent une trace physique pour les amateurs d’art. Son travail d’artiste est centré sur des questions sociales, anthropologiques, géographiques et philosophiques. LIUBA questionne le comportement humain à l’aide de l’interactivité et de la chance.